It is perhaps an indication of the renewed popularity of Doctor Who, that UKTV Drama has kicked off a new year with a daily teatime showing of some of the classic shows not in the omnibus format in which they used to show the programme at weekends, but as it was originally made in 25 minute episodes. The one difference though is that whereas in the past they always started at the start of the colour era, with Jon Pertwee stories, this time they’re kicking off with Robot, Terrance Dicks reworking of King Kong – probably most obvious in the final episode – that marked the beginning of Tom Baker in the title role. So why start out at this point? The answer is fairly simple if you look at what comes up later in the first Tom Baker season. After The Ark in Space next week we then get a run of classic monsters. 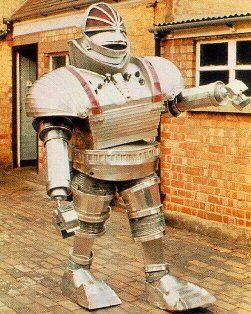 First off is The Sontaran Experiment – monsters who are going to appear again in the next season of the new Doctor Who. Then we get the classic and fan favourite Genesis of the Daleks where the Doctor is sent back in time to destroy the Daleks before they are even created – where Terry Nation makes absolutely no attempt to hide who he based the creatures on – and where the Doctor makes a fateful decision. After that we have the Revenge of the Cybermen, which it has to be said, isn’t regarded by a classic by a lot of fans, and finally that season finished off with the first and only appearance of the Zygons – favourite monster of the current occupier of the TARDIS, David Tennant. 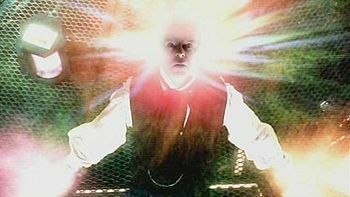 So compared to the modern series it may have some really dodgy special effects, and wobbly sets, but this was the era that was enough to inspire most of the current production team, and of course David Tennant himself, to the extent that more than a decade after it’s demise they brought back the series that is so successful now. If alternatively you’re only interested in â€œnu Whoâ€? as SFX christened it, you’ve only got a couple of weeks to wait before Torchwood returns on 16th January – this time with a pre-watershed re-edit to help in those homes where the content of the show was ruled unsuitable for the younger Who obsessives and they were banned from watching – and Doctor Who itself is due to return for a fourth series in the now familiar late spring/early summer run. So there we have it, the hybrid Dalek is no more, ousted by the original Daleks who now regard it as impure. Those who were grumbling about why the Daleks created pig men when in previous stories they have created Robomen got their wish, with the ‘final experiment’ mentioned in the previous episode which I, like I guess most viewers assumed was the hybrid Dalek proving to be somewhat more extensive, with thousands of humans kept in stasis until a solar flare causes enough gamma radiation to merge human and Dalek DNA. Unfortunately the Doctor gets in the way, and what are produced are human/Dalek/Time Lord hybrids who won’t obey orders. Then of course at the end we have the customary escape scene with the last Dalek shifting away to give the opportunity for another Dalek encounter. Although it was fairly predictable, it was none the less an entertaining episode – lots of chases including some funky Dalek shots as they chase the escaping Doctor through the sewers. We also get some aerial destruction as Daleks attack Hooverville. It also includes Solomon, one of the main characters from the first episode getting ruthlessly despatched. He tries to reason with the Daleks, saying that they are outcasts, just like the people in Hooverville, giving a grand stirring speech. There is a pause, just long enough for you to think that maybe they will agree, before the reply comes, and Solomon is dead. 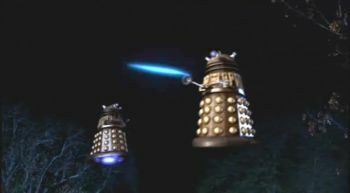 The rapidly changing hybrid Dalek, still in charge at this point steps in and saves the Doctor, but that action leads to the other Daleks questioning his position even further, before ultimately they push him aside. Incidentally, I mentioned in my posting last week that none of the actors got a trip across the pond – whilst the producer Phil Collinson joined the special effects team when they were putting together background shots. Doctor Who Confidential featured the filming of the actors for the Statue of Liberty scenes – in the car park of Penarth Leisure Centre. During a piece interviewing Phil Collinson, where the sequence is doing some self-congratulation about having found a suitable bit of wall that matches, David Tennant comes over to grumble about the fact that the producer, and even the Doctor Who Confidential crew got a trip across the pond, but he didn’t. Probably fair as even in the cash strapped days of the old series Tom Baker got a trip to Paris, and Peter Davison was taken to Lanzarote. I guess he thought that if they could afford to send the producer, they could have done a few shots of their star in front of New York sights!